The Snow Biste platform combined with the Biste Method is the quickest way to get skiers and snowboarders on the mountain and moving like a master. Its track is soft and simulates the give of snow while providing four times the amount of friction. The result is faster muscle development and accelerated learning. This patented Snow Biste deck combined with a friendly environment enables you to learn and develop the skills you need to reach your mountain goals. Safety is a key consideration, because without fear you learn faster. Our Method takes the fear out of learning. Our Reno indoor skiing facility is perfect for the busy snow sport athlete because skiing and boarding are no longer limited to ski resort hours. Lessons can take place after work, in the evening, or on weekdays at lunch when most mountain enthusiasts are busy with work and life. The foundational skills learned with the Snow Biste method translate completely to the mountain, giving you confidence from your first day out, making that day a positive and rewarding experience. Sheila’s first runs EVER on snow! And confidence enables you to learn faster, and ultimately be the star in any additional “on mountain” lessons you may take. The Snow Biste ski deck isn’t just for never-evers; it’s a process combined with technology that refines the skills of the most experienced athletes like no other process available today. 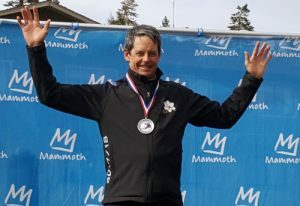 As a high level competitor in ski racing, Kris has developed techniques for pinpointing and refining the abilities of advanced ski racers. These techniques are faster and more direct than teaching on the mountain where distance and terrain make it difficult to see exactly what’s going on. The Snow Biste training environment enables an instructor to quickly pinpoint imbalances in stance, technique and problems with equipment that will ultimately enable the client to reach the next level. Junior, FIS and Masters Ski Racers. Skiing and boarding requires muscles that are not used in other sports, some of which have the longest potential for firing of any other sport. 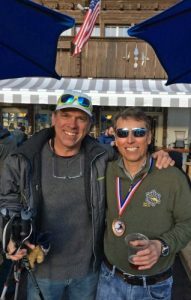 The Biste method guides and builds the right muscles to ski and board properly without the delays of developing the wrong muscles and improper techniques. If you want to learn more about muscles used and some fundamentals of skiing click quadriceps, gluteal and proprioception here. We’re not trying to reproduce beautiful nature and the outside world. The goal of the Snow Biste Deck is to create an environment that teaches skiers and snowboarders how to successfully ride the mountains faster than ever before. As a competitive athlete, that means moving up to the next level faster. 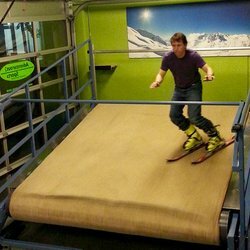 As someone new to the sport it means you and your family will be able to board safely to the bottom without being scared and cold from falling all the time. The Snow Biste deck is a sturdy construction that allows jumps, hops, spins, turns and winter sports tricks. For racers we can even do start gate practice drills on it. 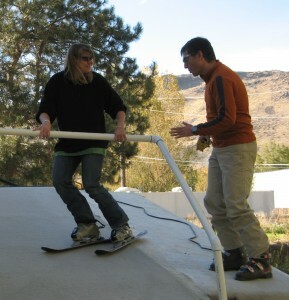 The deck can handle both private one on one and group lessons with as many as 8 participants. Group lessons include the fitness training circuit that not only gets you snow sport ready but can keep the group entertained throughout the learning experience. Snow Biste is very quiet. It requires no snow, water, ice, or gel to function, so there is no mess from the machine left on your clothes. The deck is also portable and can be brought directly to your location for corporate and private functions. Contact us directly to schedule your event. We maintain a safe learning environment, year round access, and a fitness conditioning program at Sierra Strength & Speed. If you are rehabbing from injury our method will put you back on the mountain faster with better muscle memory and higher endurance than pre-injury. Our program is supported by Naomi L. Albertson, MD of The Reno Orthopaedic Clinic as the next step after you get repaired. We’re here to help you get back on the slopes, win the race or just enjoy your mountain adventures.